In our Winter/Spring issue, we featured an article by three snowboarders who traveled around BC and Alberta in a vegetable oil-fueled bus, stopping along the way to investigate Canadian resource extraction projects, learn about renewable energy solutions and, of course, seek out fresh pow. 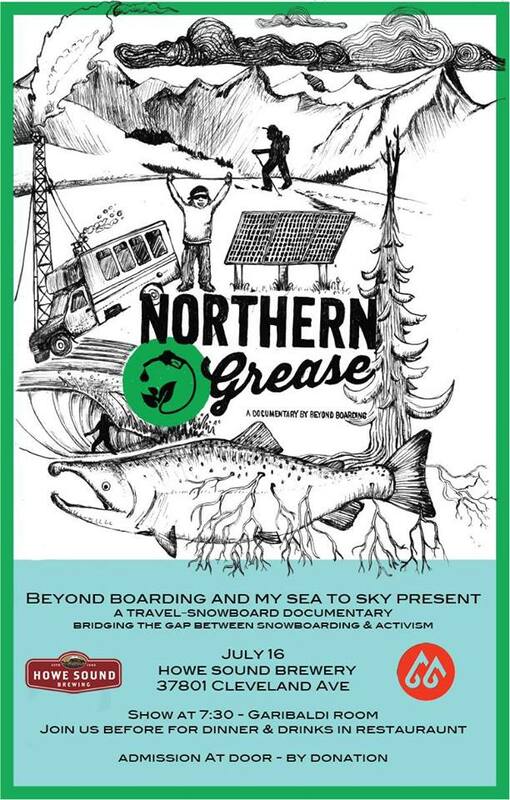 Supported by Beyond Boarding, the snowboarders—Tamo Campos, John Muirhead and Jasper Snow Rosen—were able to turn their journey into the documentary Northern Grease, which expertly documents the dangers of unsustainable resource extraction and the irreversible consequences it may have on the people and natural environment of BC. Now three Beyond Boarding crewmembers, Nicole Kilistoff, Desiree Wallace and Landon Coronius, are doing a bike marathon from Langley to the Sacred Headwaters—a 2500 km journey—to generate financial and social support for a group of indigenous land defenders featured in the film, the Klabona Keepers, in the Sacred Headwaters of British Columbia. Along the route the team is hosting film screenings of Northern Grease, including one at the Howe Sound Brewery in Squamish this Wednesday. The screening will start at 7:30 and admission is by donation. We talked to Wallace about the bike marathon, the status of development in the Sacred Headwaters and how people in the Sea-to-Sky can get involved. Mountain Life: Talk about Cycle to the Sacred: What inspired the ride and what are you hoping to achieve? Desiree Wallace: One of the world’s largest pristine wildernesses is on the threshold of becoming one of the planet’s largest industrial mining disasters. I was inspired to take action and contribute to those sacrificing the most, those on the front lines, after watching a documentary – Northern Grease – produced my dear friends Tamo Campos, John Murihead and Jasper Rosen. They shared the story of a phenomenal group of indigenous land defenders, The Klabona Keepers, who are protecting their territory, The Sacred Headwaters – not only a breath taking eco-system, but one that is essential to the long-term health of Northwest BC’s entire wild salmon ecology and deeply influences the scope of climate change resiliency and adaptation for the region of BC into the future. Ultimately, it is this small group of Tahltan people who have continued their ancestors responsibility in protecting the Sacred Headwaters, a place that we all benefit from, that has mobilized me to do the ride. For 11 years the Klabona Keepers have been fighting to protect the Sacred Headwaters against harmful mining development and once more. Without Tahltan consent, the government has given an exploratory permit to Fortune Minerals, a mining company with a plan to turn Klappan Mountain into an open-pit anthracite coal mine, 4000 hectares in size. They understand that what sustains us is not money – it is the salmon, the fresh water, the earth. That is sustenance. That is life. But, very few people in Vancouver even knows where the Sacred Headwaters is let alone, how it is at risk. A bike tour up North is quite insignificant in relation to the work they have done, but it is not only their responsibility to protect it, it is all of ours and we need to support them as they put themselves and their families on the frontlines. By connecting the population in the Southern hemisphere of BC to what is going on up North we hope to achieve this support for these incredible people and their continued fight to protect and assert their sovereignty over their sacred territory. ML: Why did you decide to get involved with Beyond Boarding and now Cycle to the Sacred? DW: In 2013 Tamo Campos, founder of Beyond Boarding, and I met in a Global Stewardship program we were studying at Capilano University and he pitched the idea to me – I jumped on ‘board’ before he could finish. Being a self-propelled athlete and a social and environmental activist, it just made sense; being able to channel the positive energy inherent to my sports in ways that genuinely support the people and environment in our world fit together all to well. What started off as a project to Iquitos, Peru quickly became a lifestyle for all involved in what now is a collective. It has mobilized me to synthesize my passion for self-propelled sports, art and social & environmental activism. I had the opportunity this winter to travel with Tamo Campos and Hannah Campbell touring Northern Grease across the province and was personally exposed to the beauty that pervades British Columbia – both geographically and within the people who are tirelessly protecting it. From spitlboarding across the beautiful mountainous regions to spending time at the Unist’ot’en camp, a resistance community whose purpose is to protect sovereign Wet’suwet’en territory from several proposed pipelines, I harnessed a deeper connection to this land and the people whose traditional territory it is. I felt I had an obligation to share this experience with others and what better way to do so than through an interactive bike tour across this province. Again, a bike tour up North is quite insignificant in relation to the work the Klabona Keepers and other indigenous land defenders have done, but it is not only their responsibility to protect the Earth, it is all of ours and we need to support them as they put themselves and their families at risk on the frontlines. We can’t only take from these wild spaces we gain so much enjoyment from, we have to give back to them. ML: What has happened with development in the Sacred Headwaters since Northern Grease was released? The government created the Klappan Initiative to address everyone’s needs (the government, the Tahltan, mining). That document is being worked on right now but the Klabona Keepers were not too impressed with it. ML: How can people support the Klabona Keepers and environmental justice in the Headwaters? DW: You can support this grassroots organization made up of Tahltan elders and families, the people who are on the front lines, whose traditional camps are directly threatened by proposed development in the Sacred Headwaters. Specifically, by continuing to share their story and financially supporting the Tahltan elders in iskut in ensuring that their traditional values are appropriately reflected in the negotiations currently underway between the Tahltan leadership and BC government around protection of the Sacred Headwaters area. Visit our Indiegogo campaign to do so.